K-Kind enough to take in a crazy 17 year old. Take my hand and drag me head first, fearless. E even if she goes bananas!! B-Bit geeky but that's what makes him BRIAN! O Ordinary? Perish the thought!!! P Purchases Mac and Cheese whenever she can. A Aimed her career towards lawer or Docter. S Stares at people she doesn't like. J Jerk at first perhaps, but a softy at heart! E Eager to get time alone with Rory when he first comes to Stars Hallow! S Seen as a rebel but those who know him, know he's just trying to figure things out! People are being very creative with the characters!! Way to go everyone! You're all wonderful! SAVE THE CORNISH GAME HENS!! Y- Y did i pick a word with "Y" in it!! L Loves her brother Luke and son Jess! I Interested in doing things she maybe isn't the best at...cooking, jewlery making, etc. Z Zelous about living...she really tries hard to love life! 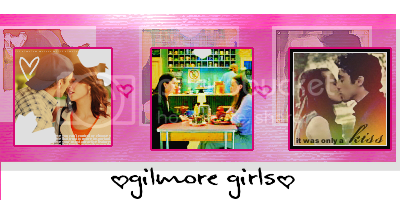 W without The Gilmore Girls! *Sorry, just had to get that out!